Below are two Cuisinart stainless steel rice cookers that perform decently, make good quality rice, and offer food steaming options. Please note that the inner bowl is not stainless steel! This 4 cup rice cooker is actually one of the first rice cookers that I have bought several years before starting this site. The Cuisinart CRC-800 is the larger 8 cup version. 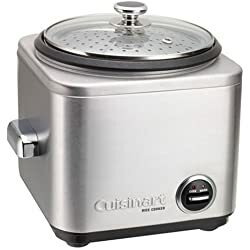 These units have an attractive stainless steel outer shell that is fairly resistant to smudging (although it does occur), are easy to use and clean, and allows folks to simultaneously steam food while the rice is cooking. Once again, it is important to note that the inner bowl of these cookers are not stainless steel and are made with a non stick coating. However, so long as folks do not scratch the inner bowl and use the included plastic rice spatula there is no need to worry about any health concerns (unless flaking occurs during the course of time). From what we’ve researched, it is only at very hot temperatures that non stick coating becomes a possible health hazard (and when it is scratched and “flakes” off). These Cuisinart stainless steel rice cookers will prepare up to 12 cups (CRC-400) to 24 cups (CRC-800) of cooked white rice at a standard quality along with decent brown rice, have an automatic keep warm mode, and cook at a nice pace with a batch of rice usually completed in under 25 minutes minus optional soaking times. There are some cons worth mentioning which are mainly the spill over issues that are common with these types of top lid rice cookers. With certain rice grains, once the water comes to a boil, excess pressure inside the bowl allows the starchy rice water to bubble and spit out the small steam vent and along the side of the bowl. A simple fix is to use aluminum foil as a temporary lid when cooking or to add some powered chicken seasoning which helps break up the bubbling. However, option 2 does lead to more crusting at the bottom once finished. All basic rice cookers experience some form of rice crusting at the bottom. Both of these Cuisinart stainless steel rice cooker models come with a non stick bowl, stainless steel steam basket, serving spatula, special measuring cup, and manual with some included recipes. While they are not the best basic rice cookers for the money and are not true stainless steel rice cookers, they do have a nice modern look and feel and perform okay for the most part.